Hi, this is Kumi 🙂 Continuation of Luzon trip, Feb, 2014. We went to Angeles from Baguio by a bus, the fare was Php Php 306 (USD 6.8). I heard Angeles is famous for a kind of “night life”, but of course our purpose wasn’t it. There is my friend’s friend, we went there to meet him. ▼From the window of the bus. ▼This is it. I feel ashamed it’s written Japanese language. I guess so many Japanese men use it with Filipina… Gross. ▼It’s common in the world, like this… No, I don’t know about Japanese situation…haha. It was really simple, just like a normal business hotel with red lamps. No gorgeous hot bath, no large room or no game machines. Just for sleeping. ▼They lend it for hours. It creep me out imagining for what is it. 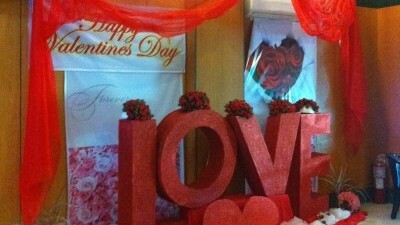 ▼There was a embarrassing decoration… because it was February…Umm… It made lonely person like me feel hard. But I think, if it lacks this, it can be so terrible for female. Girls become pregnant (because of lacking contraception), they cannot do abortion, it’s very difficult to divorce (possible but it requires a lot of money) so some of men don’t want to get married and run away… then, it makes so many single mothers. I saw those cases so much in Philippines. I know a lot of Filipino single mothers, they are still very young like 20 years old. Perhaps it’s different from Japanese case, because in Japan, most of cases, single mothers have to grow their children without helping by relatives or neighbors… if they are lucky, they might be able to rely on their parents, but just that. According to the data, the most poorest people in Japan are single mothers. I think Japanese situation is different from Philippines’ culture. Anyway, still I don’t think it’s good that “fathers” ran away from their responsibility and only single mothers have to grow their children. My friend proposed me to go to Subic separately. I agreed it because I know that sometimes it makes travel not to be fun if we are always together, especially this trip was supposed to be a solitary journey for her. Anyway, I must to go to Manila ahead, so it might be a good timing. So, my friend went to Subic ahead. Me, I was in two minds – should I go to Subic or not? Because, I couldn’t find any cheap rooms at that time. My budget of rooms was Php 300 ~ 400 (USD 6.5〜9) per one night, but every room was so expensive… at least Php 700 (by Agoda) No dormitory! I guessed, maybe there is no visitors? Maybe. There is only one cheap hostel, but it seems so far from Subic city. I had a reason to go to Subic. My previous coworker lives there. She loves beer also, so we promised to drink together, but we had had no chance to do that. I don’t want to finish it just as verbal promise. and, eventually I found it! By Mr. google, not Agoda. One night Php 430 (USD 9.6) but it was okay. So, I decided to go to Subic.